From the creative geniuses behind South Park, Matt Stone and Trey Parker, with music by Robert Lopaz, co-composer of Avenue Q and Frozen, comes the smash hit comedy musical The Book of Mormon!! After seeing Avenue Q, Parker and Stone were inspired to create a musical of their own with Robert Lopez, and began meeting to discuss and write – a process which, including research involving a trip to Salt Lake City to meet Mormon missionaries, took almost 7 years. It was well worth the wait – the Book of Mormon took Broadway by storm, setting record ticket sales for the Eugene O’Neil Theatre, and winning nine Tony Awards including Best Musical! The plot follows two young Mormons as they journey into a Ugandan village to proselytyse, and the challenges they face in convincing the locals, who have other more immediate problems to hand, such as famine, oppression, and AIDS. Both Parker and Stone grew up in Colorado, and are familiar with members of the LDS church, and religious influence has played a part in their previous comedic works. 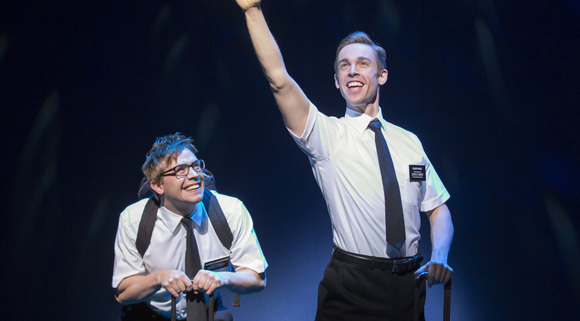 Irreverent, offensive to some, but unabashedly truthful, The Book of Mormon is about as entertaining and hilarious, yet warm-hearted a production as you are ever likely to find anywhere. Furthermore, the extensive research and time put into the production so in how amazingly good the music is – it won a Grammy award for best Musical Theatre Album, and the original Broadway cast recording broke the record for highest-charting in over 40 years, reaching the number 3 spot on the Billboard charts. Songs such as “Hello!” will remain stuck in your head for days after!! So don’t delay – grab your tickets to see this wonderful, feel-good slice of funny for yourself.